When the weather is cold, wet, and snowy, nothing is more comforting than a platter of comforting meatballs, browned and braised in a fragrant and spicy tomato sauce. These meatballs take inspiration from my two favorite types of meatball, a Moroccan lamb kefta and an Italian meatball, and roll them into a spicy and oh-so satisfying dish. In this recipe, the ground lamb is seasoned with North African spices, and each ball is filled with a nugget of feta cheese nestling in the center. After a quick browning in a skillet, they are popped into the oven to braise and finish cooking in a blanket of roasted tomato-pepper sauce infused with spices and a kick of heat, harissa-style. It may be chilly outside, but these meatballs will surely warm you up. 1. Combine the sauce ingredients in the bowl of a food processor and process to blend. 2. Combine all of the meatball ingredients, except the feta, in a bowl. Using your hands, gently mix until the ingredients are evenly distributed. 3. Shape the meat into 1 1/2 inch balls. Make a small indentation in the centers with your thumb and insert a feta cube, then close the meat around to seal it. Place the meatballs on a plate, cover with plastic wrap, and refrigerate for 1 hour. 4. Heat the oven to 350°F. Heat 1 tablespoon oil in a large ovenproof skillet over medium-high heat. Add the meatballs in batches, without overcrowding, and brown on all sides, turning as needed, about 5 minutes. (The meatballs will not be cooked through at this point. They will continue to cook in the sauce.) Transfer to a plate and repeat with the remaining meatballs. 5. Add the sauce to the skillet and cook briefly over medium heat, scraping up any brown bits in the pan. Return the meatballs to the skillet and nestle them in the sauce, turning to coat. Transfer the skillet to the oven and cook until the meatballs are thoroughly cooked through, about 30 minutes. During the last 5 minutes of cooking time, sprinkle the crumbled feta over the lamb. 6. 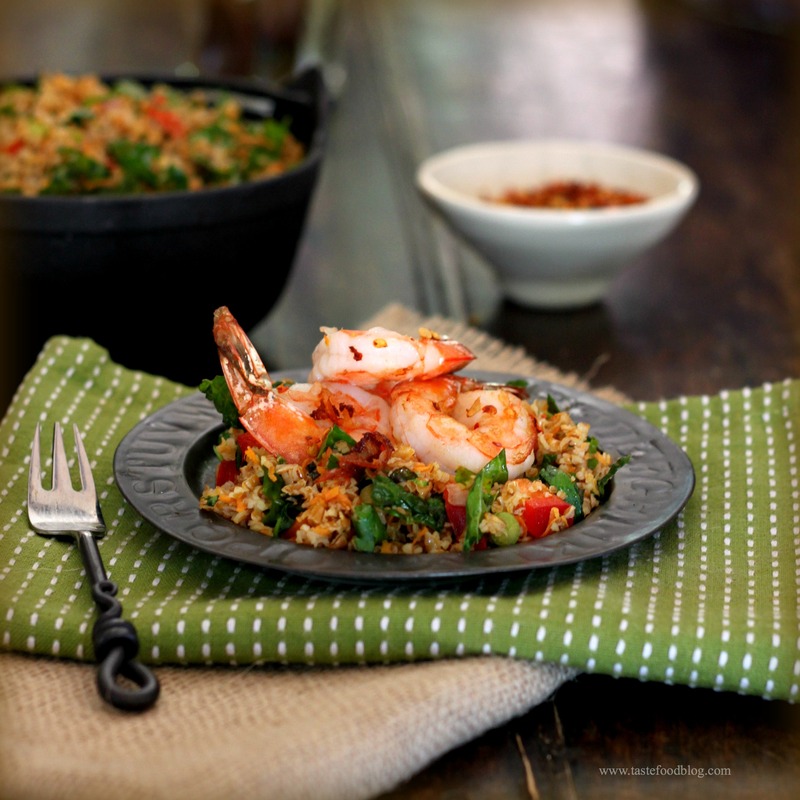 Serve with couscous or rice and garnish with chopped mint or cilantro. There is something intrinsically satisfying about a grain salad. Hearty, fresh and toothsome, brimming with greens and chopped vegetables, it’s both nutritious and versatile. Tabbouleh is a Middle Eastern salad made with cracked wheat or bulgur. The grains are softened with water, lemon juice and oil and tumbled with spices and fresh herbs. I like to add shredded kale and grated carrot to tabbouleh. The sturdy greens are tenderized by the oil and lemon, and the sweetness of the carrot rounds out the tangy citrus and spices. The salad is delicious as is or stuffed into pita pockets with crumbled feta and a dab of harissa. 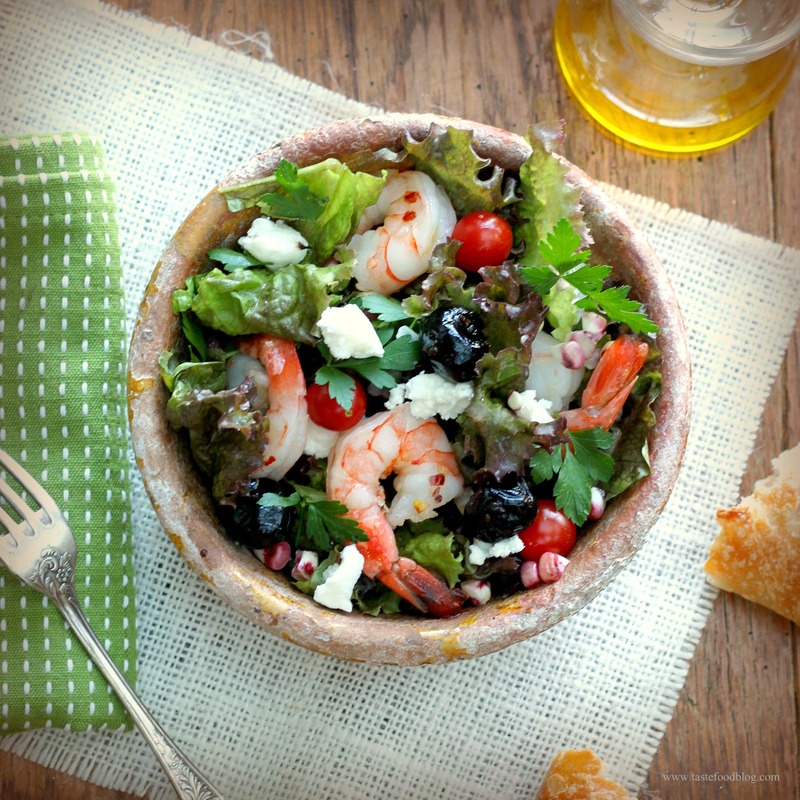 In this recipe I’ve topped the salad with pan roasted shrimp for a light and healthy meal. If you prefer another grain, feel free to substitute quinoa, wheat berries or couscous for the bulgur. For a vegetarian option, sprinkle with feta cheese. Place the bulgur in a large bowl. Pour the water over the bulgur and stir to combine. Add lemon juice, olive oil, salt, pepper, cumin and Tabasco. Stir again. Set aside until the liquid is absorbed and the bulgur is tender but chewy, about 20 minutes. Add the remaining ingredients and stir well. Taste for seasoning. If necessary, add more olive oil to moisten the salad. Heat the olive oil and the chili flakes in a skillet over medium high heat. Add the shrimp in one layer and cook until pink in color and just cooked through the center, about 2 minutes per side. Remove from heat. Sprinkle with salt and drizzle with juice from half a lemon. To serve, arrange salad on a platter or divide among serving plates. Top with shrimp. Garnish with freshly ground black pepper and chopped parsley. Drizzle with extra oil if desired. 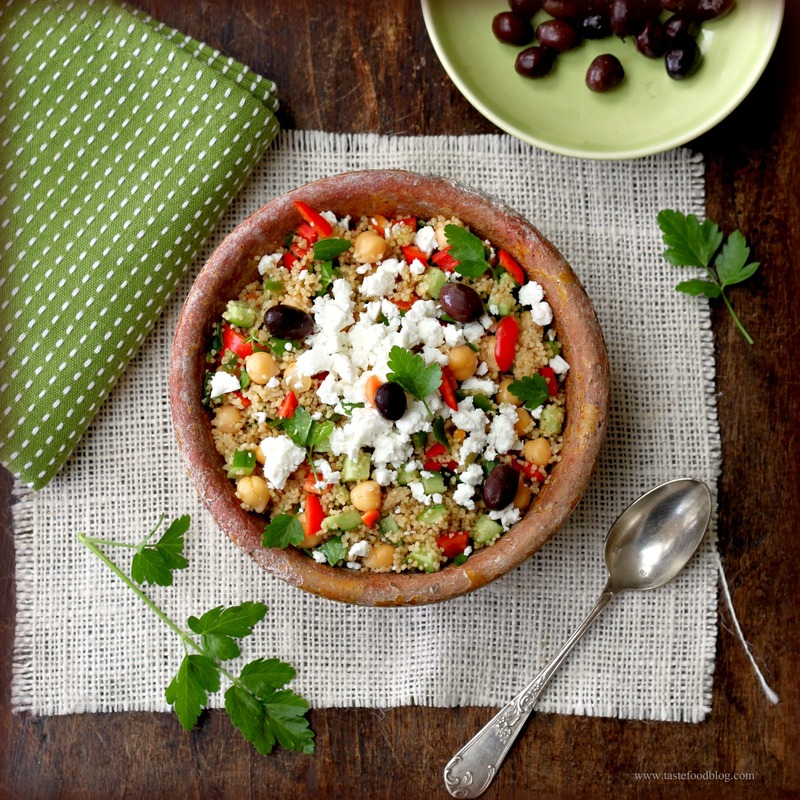 For the latest installment of Cooking for your Health, which nicely coincides with the Meatless Monday initiative, I present you with this recipe for Greek Couscous Salad. It’s still winter in this part of the world, although the weather is behaving more like spring. Hefty winter salads are a healthy, satisfying and an economical way to get our daily dose of vitamins and nutrients during the cold season, while providing light yet substantial sustenance. 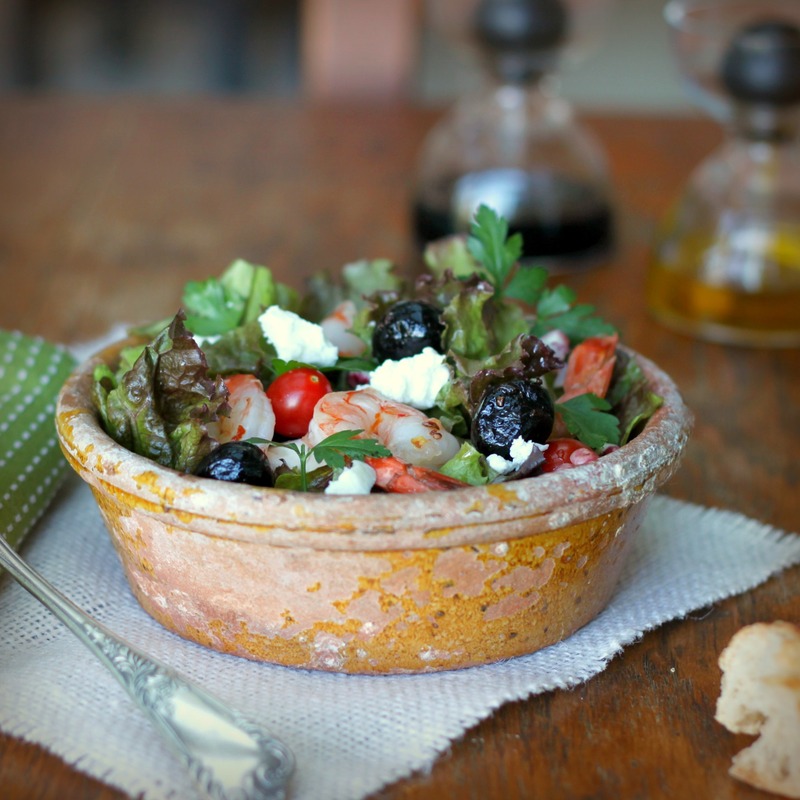 This recipe looks to the Greek salad for inspiration. 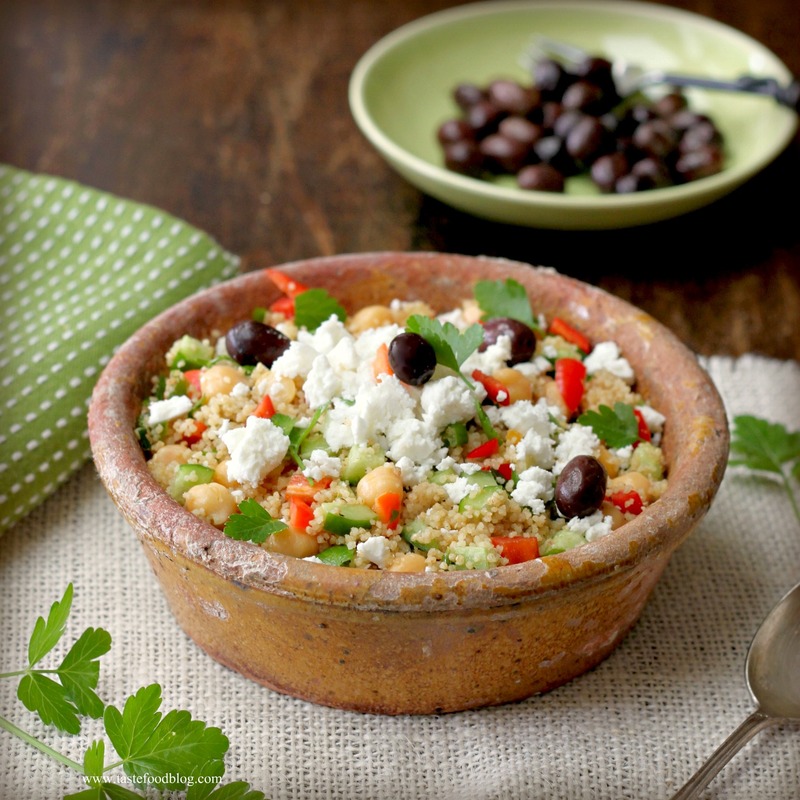 Chopped cucumber, onion, sweet peppers and fresh herbs, rich in Vitamins A and C, are tumbled with whole wheat couscous and protein-rich chickpeas, then topped with a sprinkling of feta cheese. Boosted with lemon, garlic and cayenne, this salad is at once healthy and ridiculously good. I like to serve it simply as-is or scooped into pita bread with a dollop of tsatsiki and harissa. Healthy and meatless don’t get better than this. This salad is very forgiving in its ingredients. 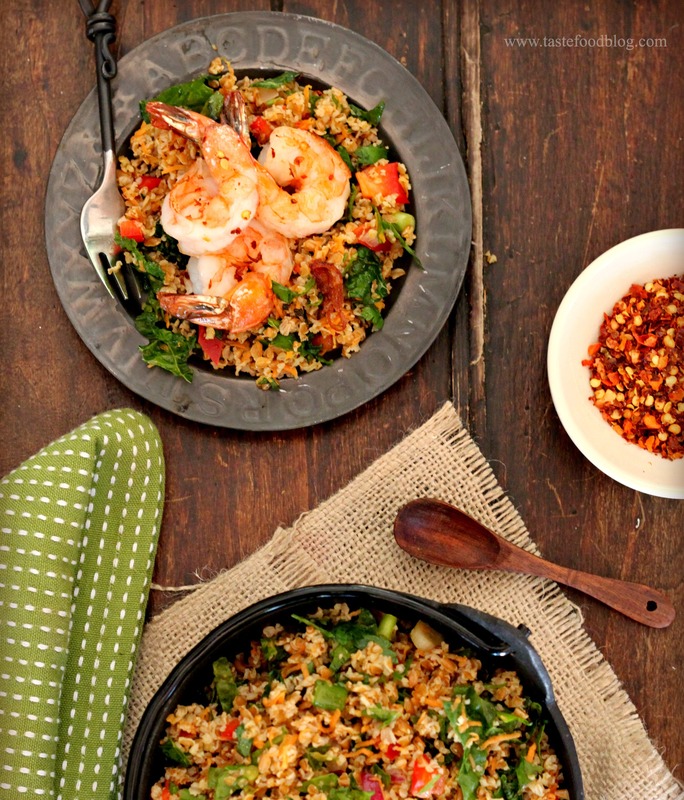 The couscous may be substituted with another favorite grain such as farro or quinoa. Feel free to add more or less of the vegetables to the couscous to your taste. The important thing is to have a variety of texture and lots of crunch. Serves 4 to 6. Bring water, 2 tablespoons olive oil and 1 teaspoon salt to a boil in a medium saucepan. Remove from heat. Stir in couscous and lemon juice. Cover and let sit until all of the liquid is absorbed, about 5 minutes. Fluff with fork and transfer the couscous to a bowl. Add remaining ingredients and 1 tablespoon olive oil. Gently mix to thoroughly combine. Taste for salt and seasoning. Serve warm or at room temperature garnished with olives. Shrimp and feta cheese make a perfect couple. The sharp salty cheese is a perfect complement to the briny sweet shrimp. I like to combine these two friends in rice or orzo dishes. I also enjoy baking them in a gratin with tomatoes and olives, drizzled with ouzo – which was my original intention for dinner tonight. However, time got the best of me, and for a super quick fix I tossed the shrimp in this salad instead. What would have been a simple green salad graciously accommodated sautéed shrimp and chunks of feta, transforming itself into a light and fresh main course. As for the ouzo, it was hardly bypassed, but turned into an apertif to launch our dinner. A very acceptable compromise, indeed. I also added red corn kernels to the salad, because I had them – and they looked so pretty with the shrimp. Serves 4. Whisk all of the ingredients except the oil together in a small bowl. Slowly whisk in the olive oil in a steady stream to emulsify. Set aside. Heat the oil and red pepper flakes in a skillet over medium-high heat. Add shrimp in one layer, without overcrowding the pan. Cook, turning once, until bright pink on both sides, about 1 minute each side. Transfer shrimp to a plate. Cool. Combine the greens, tomatoes, red pepper and onion together in a large bowl. Drizzle 1/4 cup vinaigrette over the greens and toss to coat. Divide among plates. Scatter olives and feta over the salad. Arrange shrimp on top. Drizzle with additional vinaigrette to taste. Garnish with parsley. Serve with bread or pita. I don’t know about you, but I think I ate a month’s worth of meat over the weekend. With July 4th falling nicely on a Monday, it meant a 3 day weekend was entirely devoted to barbecues. Our house, friends’ houses, the beach: all locations involved a fire and platters of smoked and grilled ribs, steak, chicken, salmon. Now it’s time for a little break. To begin this short week, I will invoke a brief barbecue time-out. 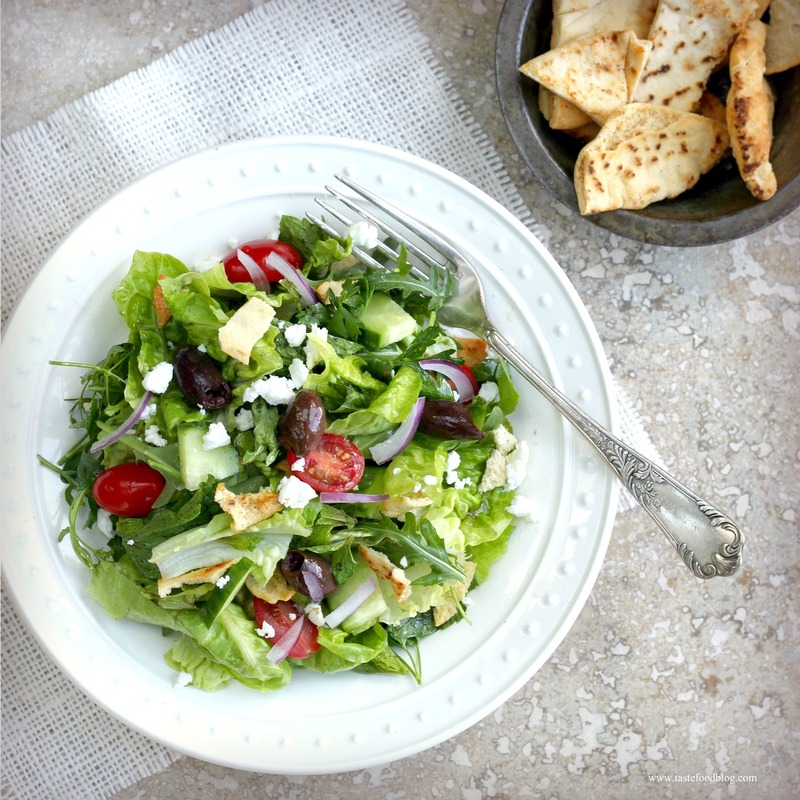 Dinner tonight will be light, fresh and vegetarian – a Fattoush salad. Fattoush is a Middle Eastern garden salad with pita bread. 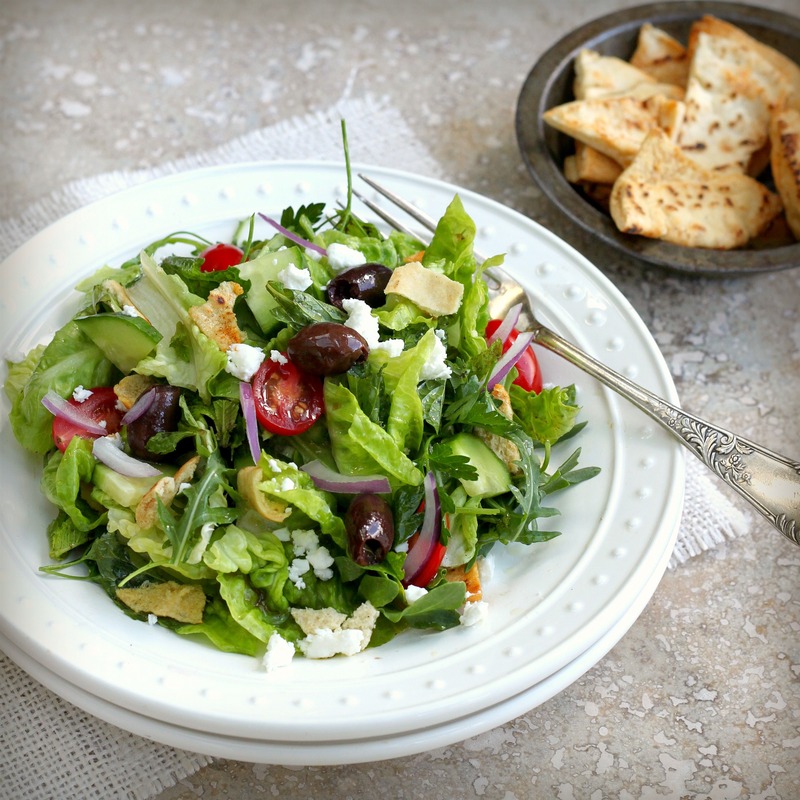 Day old pita is toasted, crumbled and tossed with greens in a vinaigrette, adding texture and substance to the salad, while the dressing softens the bread. Extra Mediterranean ingredients, such as olives, feta, mint and sumac (a dried Middle Eastern spice with tart lemony notes) make this salad special and addictively good. When the weather is warm, this is a perfect easy meal and a nice break from the grill – at least for a day. Mix all of the ingredients, except the olive oil, together in a small bowl. Whisk in olive oil in a steady stream until emulsified. Preheat oven broiler. Brush pita bread with olive oil. Sprinkle with a little salt and pepper. Cut each pita circle in 6 triangles. Toast in oven, turning once, until crisp and light golden. Remove from heat and cool. Break into pieces. Toss the pita pieces with the arugula, romaine, parsley, cilantro and mint in a large bowl. Scatter the tomatoes, cucumber, onion, olives and feta over the salad. Drizzle with half of the dressing and toss to combine. Add additional vinaigrette to taste and toss again. Serve garnished with extra feta. 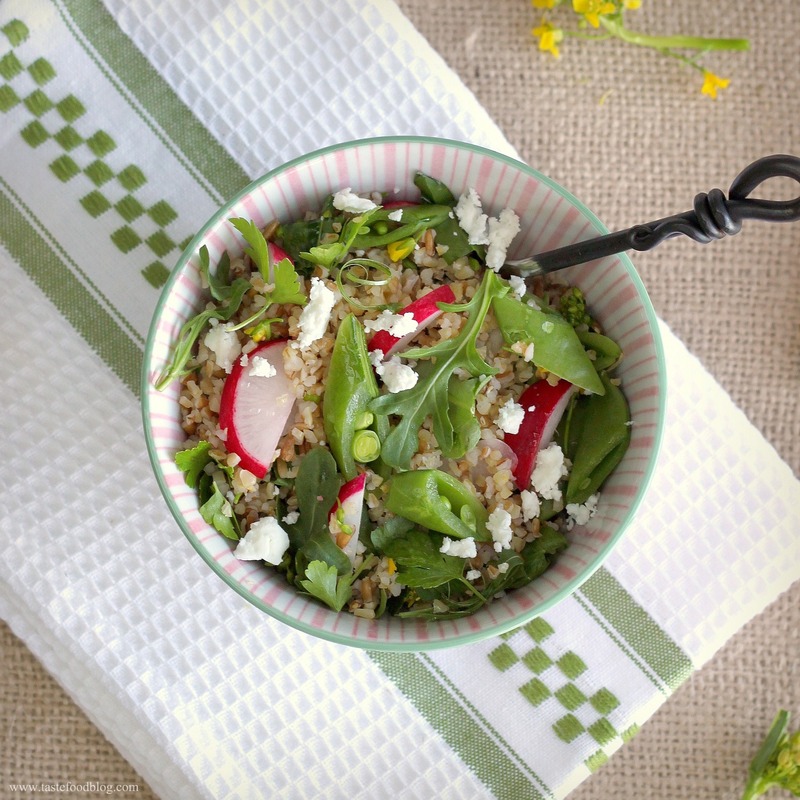 Try this salad on for spring: Bulgur Salad with Lemon, Radishes and Snap Peas is packed with fresh herbs and greens, studded with radishes and sugar snap peas. It’s a refreshing version of tabbouleh, milder in flavor and bursting with seasonal vegetables. What is tabbouleh? 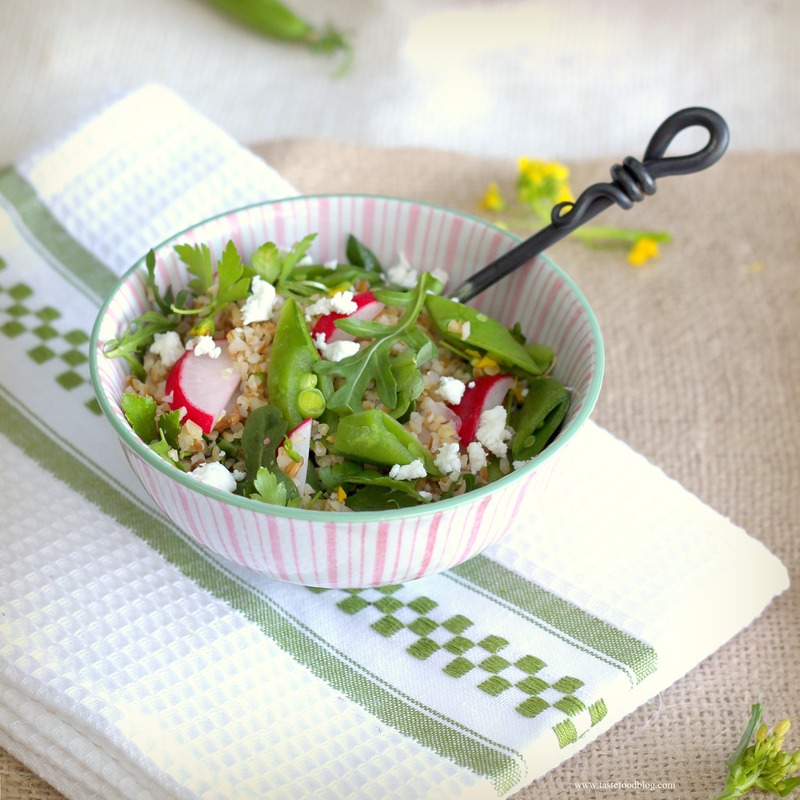 An addictively delicious Middle Eastern salad featuring bulgur wheat, steeped in water or stock, then tossed with an abundance of fresh parsley, mint, lemon and seasoning. Its name translates to “little spicy” which is probably the tipping point for those of us who can’t get enough of this healthy salad. As a concept I love playing with variations of tabbouleh. This recipe is inspired by the spring vegetables I purchased at the farmers’ market today. 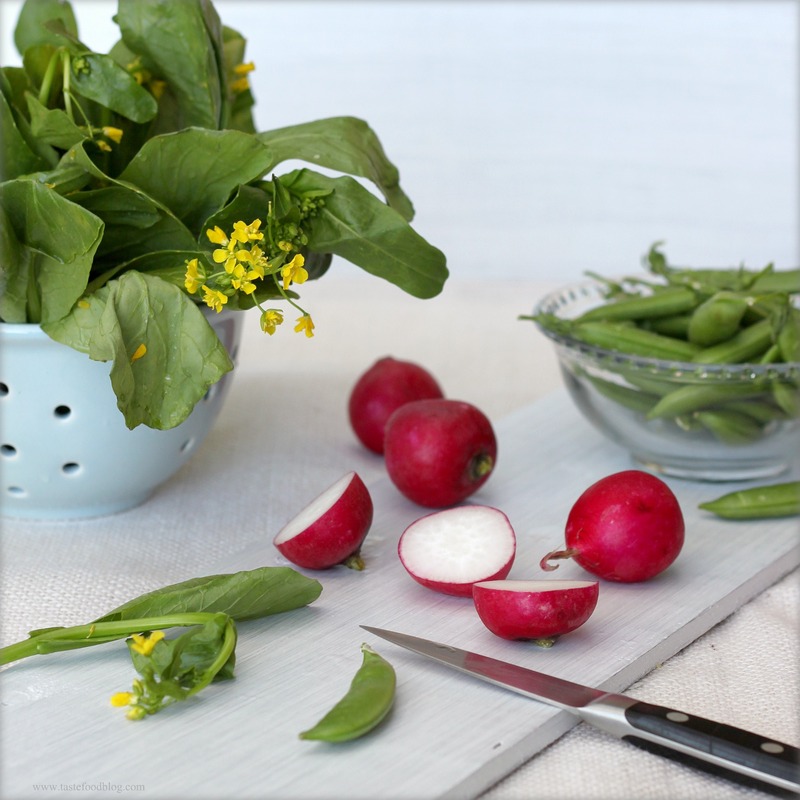 Kale flowers, radishes, sugar snap peas and red spring onions are tumbled with bulgur infused with lemon and olive oil. The spicing is gentle, in deference to the mild sweetness of the vegetables, without ignoring the “little spicy” contingent. Delicious and satisfying, enjoy this as a healthy salad, side dish or light main course. I served it with pita bread and hummus for an easy vegetarian dinner. The bulgur should be tender but firm when cooked. The kale flowers are optional yet lovely as a bright garnish. Serves 4. Combine bulgur, water and 1 teaspoon salt in a medium saucepan. Bring to a boil; remove from heat. Cover and let sit until the bulgur absorbs all of the liquid, about 20 minutes. Uncover and add 1/4 cup olive oil and lemon juice, fluffing the bulgur with a fork. Cool to room temperature. Add 1 teaspoon salt and all the remaining ingredients, gently tossing to combine. Taste for seasoning. Serve on a bed of greens or in pita pockets.